Home > Timesheets > Timesheets - FAQs > How Do Avaza Timers Work? How Do Avaza Timers Work? Avaza timers allow you to accurately record time without having to remember the start and end times. To start tracking time instantly, click the Global Time Tracker button from any page in Avaza. The Timer will immediately start tracking time. You can also click on the Global Timesheet View button (the clock icon next to the Play button), and start or continue tracking time on specific tasks using the pop-up. 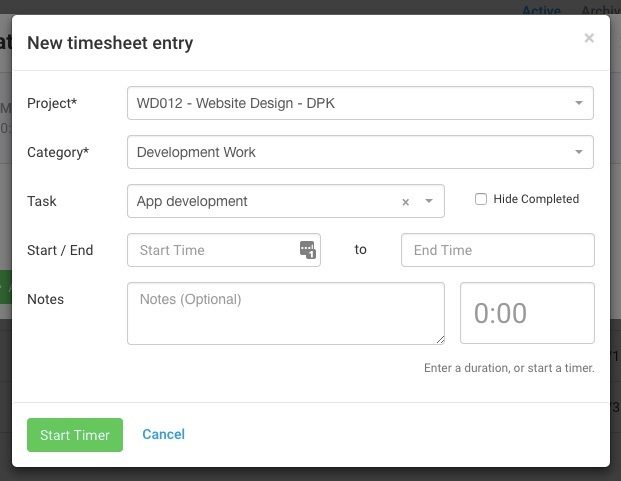 You can start a new timer by navigating to the Timesheets screen from the Side Navigation. Click the ‘Add Entry’ button and then press the ‘Start Timer’ button without filling in the duration. Another way of starting a timer is by heading over to the project and opening the task. Navigate to the sub-tab with the timer icon and click on ‘Add Entry’. You will then see the same ‘New timesheet entry’ popup pre-filled with the project and task details. The timer runs in the cloud and doesn’t require you to keep your browser or app open. You will be able to see the timer running in the top navigation bar, and can click on Stop at any time to stop tracking time. Need any more help? Feel free to contact our support team via chat or email.